While supporting our customers, we noticed that working with categories in WordPress can sometimes be confusing for people who haven’t worked with WordPress before. We often hear questions like How to create pages for categories? How to create categories in WordPress? How to link categories to pages? How to assign posts to categories? How to create category archives? and many more. We decided to publish a WordPress tutorial about this topic to help people who are new to WordPress and who have never used category archives with their WordPress themes before. By navigating to Posts => Categories in your WordPress dashboard, you will be able to create new categories and also see a list of previously created categories. In case you just started with WordPress, you probably will only see the WordPress default category called Uncategorized. You can add more categories that are suitable for your website or content genre and then click on the Add New Category button to save your new category in WordPress. When you navigate to Posts in your WordPress dashboard, you’ll see an overview of saved and published posts. You can click Quick Edit for a particular post and a panel with a few options will be displayed. You can now assign one or more categories to your post and group your posts in certain categories of your choice. When assigning preferred categories to your posts, these posts will be displayed on the particular category archives automatically. Make sure you save your changes. Please note, in general there are multiple ways to create categories and assign posts to categories in WordPress. For example when you initially create new posts under Posts => Add New, you can immediately assign categories from the available categories or you can create new categories right there as well. Here you can find more information: How to create new posts in WordPress. While supporting our customers we also noticed that the main reason why people start creating pages instead of using category archives properly is because they wanted to add the categories to their navigation menu. There really is no need to create pages for this as you can add category archives to your navigation menu the same way as you would do with pages. You can navigate to Appearance => Menus in your WordPress dashboard, create or edit your custom menu and then add any menu item that you would like to appear in your navigation, it doesn’t matter if these are pages, categories, tags or even external links, this completely is up to you. That means if you would like to add category archives to your custom menu, simply select the menu you want to modify and add those menu items you like. Adjusting the order of menu items is always possible via drag & drop. Please don’t forget to save your changes. By the way, you can also modify menus in WordPress within the customizer. How to use a category as menu item? How to create category landing pages? I need to change the appearance of the category pages of the blog. How can I do it? 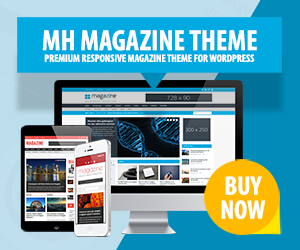 Hi Alex, we don’t know what WordPress theme you’re running, but our popular MH Magazine theme offers several archive layouts which you can choose from through the options panel. Hi, can I deactivate archive sites similar to the following example? Hi Rene, yes – you could either modify the permalink structure on your WordPress website or disable date based archives by using SEO plugins.